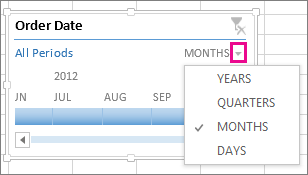 Instead of adjusting filters to show dates, you can use a PivotTable Timeline—a dynamic filter option that lets you easily filter by date/time, and zoom in on the period you want with a slider control. Click Analyze > Insert Timeline to add one to your worksheet. Much like a slicer for filtering data, you can insert a Timeline one time, and then keep it with your PivotTable to change the range of time whenever you like. 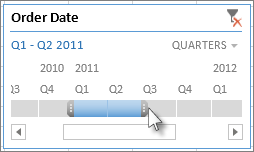 Click anywhere in a PivotTable to show the PivotTable Tools ribbon group, then click Analyze > Insert Timeline. 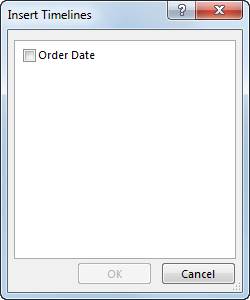 In the Insert Timeline dialog box, check the date fields you want, and click OK. 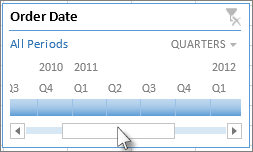 Provided your PivotTables are using the same data source, you can use a single Timeline to filter multiple PivotTables. Select the Timeline, then on the ribbon, go to Options > Report Connections, and select the PivotTables you want to include. To clear a timeline, click the Clear Filter button . Tip: If you want to combine slicers with a timeline to filter the same date field, you can do that by checking the Allow multiple filters per field box in the PivotTable Options dialog box (PivotTable Tools > Analyze > Options > Totals & Filters tab). To change the style of the timeline, click it to display the Timeline Tools, and then pick the style you want on the Options tab.